Here are the results of my pick selection. FF = ‘form factor’. SP = ‘scoring potential’. * = actual bet. 9 correct out of 16. I placed a £1.00 bet on a selection of 8 from this 16, and was let down by 1 team – Leyton Orient, which would have won me £40.00 if they had won. No matter what system any one uses, no one could have foreseen or even have intuited some of these results, they came right out of leftfield, however, I haven’t checked the historical data for these matches over the last 5 seasons. Some of these results suggest that some teams were given injections of a super serum before leaving the dressing room in order to overcome poor form and absence of scoring ability. Very annoyed with Leyton Orient! Just goes to show that ‘form’ can appear and disappear on the day. It’s a very volatile commodity, but the most accurate data element to go off when deciding whom to bet on. Thought I’d take a shot at your question on ‘form’, what it is, and what data elements provide for its inclusion in accurate probability rankings? Form is fundamental to the success or failure of the team. It signifies consistent strong or weak team performances. It’s not just indicated by the amount of games a team wins contiguously, but how they win the games, and by what score. The only reliable data elements one can use to build a good and accurate probability rank are how many wins, draws, and losses a team makes, but also by the goals they score and concede. Other factors do come into play such as venue, weather, injuries, but the effects of these will show up in the aforementioned data elements, and the fact is, these superfluous effects are not (or shouldn’t be) long lasting, certainly not through an entire season. An earlier poster remarked (as I have in another post to you) that past season’s results do not affect the current season, as many variables change season to season; managers and players depart the team, new ones come in. The team may have won promotion or have suffered relegation, so past season’s performances are not good indicators of how well a team will do in the current season, only current results indicate current form. As an experiment to show the efficacy of the system I use for ‘win’, ‘draw’ and ‘loss’, here are my picks for this coming Saturday’s games. Let’s see (gulp) how it plays out? Here I give 16 teams selected to win their match, all based on ‘current form’ and ‘scoring probabilities’. Out of this selection that my system gives, I would only bet on 8 matches on an accumulator. My ‘hit’ rate has been 6 out of 8 consistently, and thus have never won an accumulator yet (lol). A team can overturn a poor run of form in one match, or a team experiencing a good run of form can equally dip in form in one match, both circumstances lead to losing the bet. Sods Law might deem me not getting one right! You may not believe it, but I’m not a big gambler. I do the football and the Irish Lottery. I have never won on the football, but have won many times on the Irish Lottery, pick 3 from 45 (£576 each win). I am currently unemployed due to redundancy last year, so have a lot of spare time on my hands, and thus I’m trying to keep both body and mind active while out of work. I am certainly not looking to supplement income through gambling, that I know would be silly. I don’t touch horse racing as the only thing I know about a horse is that one end talks and the other end provides copiously for gardens. So, in my abundant spare time I am looking at games of betting and probabilities, which provides me with exercise on my Excel skills and formulae, whilst hopefully aiding me to a higher win probability whenever I can afford to make a bet, which hasn’t been for sometime now. The two games I focus on are football and the Irish Lottery. 1 number to reappear in the next game? 2 numbers to reappear in the next game? 3 numbers to reappear in the next game? 4 numbers to reappear in the next game? 4 numbers repeated 1 time. …if we dismiss the X4 repetition as a statistical quirk, the amount of the other repetitions have to be circumspect in a truly random game? If we can find the odds for 2 numbers reappearing the next game, and then multiply that by 40, I should think the likelihood that the lottery game is truly random can be discounted? I believe the reason why repetition is purposely built into the game is to ensure that players cannot dismiss using the previous drawn numbers, as this would mean they would be picking from 39 numbers instead of 45, which would be viewed as an unfair advantage. Inbuilt repetition ensures picking from 1 to 45 numbers. The conclusion is then that lottery games are not truly random? However, knowing this can be used to advantage, because it infers a deterministic pattern (yet to be discovered) appearing over a large enough sampling. Back again to clarify some points I make in my post (Football Betting Odds Calculation Course – How to Calculate Odds – Over / Under ‘X’ Goals). In the second paragraph where I state…”…and using only historical result data…”, should read “…and using only recent results data…”. Man City’s score probability is not 50.8%, but 34.7%. I mistakenly used a variable element from a different competition, and have adjusted the probability. Form factor remains the same, and thus Man City should still win, if both teams play to form. I only use recent results data in my own spreadsheet, and quickly realised that it is very important to use the right data elements in order to achieve good probability figures that can guide one’s betting. The older the season becomes, and thus, the more matches played, the data elements entered onto the spreadsheet will mature and provide more accurate probability figures than at the start or earlier part of the season. I watched one of your videos on YouTube, and saw just how comprehensive your spreadsheet is. My own spreadsheet is nowhere near as comprehensive and involving, in fact, the amount of data elements I use is only 10, but I know they provide me with an accurate real world probability figure I can use to draw out the matches on which to bet – between 6 and 8 matches only each week. Of course, there are pros and cons to all systems, and mine is no exception. The fact that my system, my spreadsheet, and the data I use, is only meant to draw out form strength and weakness of each team, and these two variables will indeed, constantly vary throughout the season, the variability of the ‘unknown influence’ to interject in real time upon the probability figure, remains a constant threat even while the game is being played, and after the bet has been made. No amount of data can include the ‘unknown influence’…and that’s the con to my system, and the reason why I haven’t won an accumulator bet. I am currently achieving 80% accuracy with my predictions, which is why I am now looking at combination bets. These bets allow for one or two of ones predictions to be wrong or fail to materialise, but will still pay out on the predictions that do materialise. However, the cost of the bet for combinations is a lot higher than accumulator bets. Bad afternoon , since today , betting exchanges have been banned in my country , we can not use betfair.com , betdaq.com anymore . I thought it never would happen :(. We can bet only in traditional bookies with local domain. I want to say, that this site is a great resource for betting ideas and statistical analysis! Really great work you have done here! But one question keeps me wondering! So, you say that you take into consideration last 25 matches and some results are dated really long time ago! But to me this does not make any sense and I explain why – well teams that are playing today dont have a memory or any connection to games that they have played years ago! I see this as flipping coin, if you take random coin and it turns on one side 10 times in a row, the 11th time will still be a 50/50! So why do you take those games that have been some years ago in consideration, its the same as with coins? How is it different? If both teams have played lets say 50% of their last matches as draws, taking in consideration all the other aspects you mentioned as stadium recent games, would you really pick draw next game with odds lets say 2,5??? =) From stats its a value no? But in reality I think its different, because teams don’t have that kind of memory to take their last 25 games into playing their 26th game! Every game is random and it makes more sense to consider form only, because it indicates of problems or advantages of that team at that moment! This is how I see it, but maybe I am missing something and I am totally wrong! Thanks for your question, Torres. Unfortunately, there is no quick answer, but you will find much food for thought in this blog. You are partly right, team members may not have memories of particular matches, especially if they were played long ago, but the format of a club does not change as fast as players. Therefore, although football results are a kind of random events, but they are not coin tosses. A coin certainly doesn’t have a memory. However, if your throw the coin often enough you’ll find the expected 50/50 distribution. And if teams play often enough then you’ll find the dominating team will win the expected percentage of matches, for example. Good afternoon , i will consider the course but i must wait some months because i don’t know what is the future of betfair.com in my country ; is your tutorial -Basic Betting Course Under/Over- valid for 1X2 and Correct score or not? Yes, we have previously read the PDF file you linked to, but “there are many ways to skin a cat”, and in our opinion, rating the strength of goals scored according to the strength of the opposing team is not as relevant. So, to answer point 1 of your questions, no, we do not use this style of table positions system in our analysis. You can also consider Poisson distribution and a whole host of other statistical methods and instruments, but the key is what works for you and what is easiest to manage/maintain. Yes, some of our spreadsheets contain macros just to save time – effectively, they are just formulas which produce a certain cell display depending upon the content of the figures entered into other parts of the tables. We recommend you concentrate on getting a reliable system in place before worrying about cosmetics such as macros at this stage. It’s easy to trust macros and their results too much and they will certainly cloud your judgment if you do not have 100% understanding of the mechanics of your own system before you begin using them. This teaches you how to calculate accurate percentages, odds, probabilities and ultimately value. In your position, we think it is the best investment you can make to relieve you of the uncertainty you currently face. We are sure that the investment would be recouped fairly quickly as soon as you have mastered the course and have learned how to make regular profits with your betting. Additionally, we are here to offer full support with anything you do not understand within the course. Hope this helps Panos, and thanks as always for your interest in our blog. Hi Soccerwidow , i have some questions for today. http://www.football-data.co.uk/ratings.pdf About goal superiority rating system. 1º-Sub-question; Do you use Table positions (as in the pdf mentioned) in your betting system to rate the teams? 2º (Offtopic question) , Some days ago you have said to me that you just use Excel to make the calculations , my question , Do you use Macros in your excel spreadsheets? 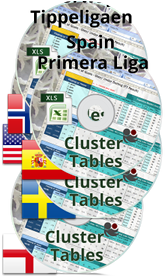 , i know it’s a silly question , i have a small idea how to use excel (at least at very basic level) i have data base from 5 key leagues from last 10 years and i can try some strategies , i can do +, -, X, /, % , use =if( =And( =or( and use some filtres , nothing more , but i don’t know if necessary to use macros… because sometimes i have a feeling that i need to automatize some things. pd: i always read your betfair blog (i use google translator) , you have given me some ideas to how to betting , (about form in football etc) but i dont have a real idea to how to get your percentages yet (for 1×2 , o/u 1,5 2,5 etc) ,i’m trying , some times close but not exactly like your percentages; and about soccer-rating.com i have several questions but these are questions for another day.